NEXT UP! Booklover’s Burlesque: Wicked Wordings! I am thrilled to be making my Booklover’s Burlesque debut this Friday! Friday, October 20th, 2017 at Crush Bar in Portland! Booklover’s Burlesque is Portland’s sexiest literary salon which matches titillating, inspiring, and empowering book readings with burlesque performances all in one show! Professional readers, actors, or local authors/writers read aloud a three to five minute piece of poetry, fiction (from any genre), memoir, non-fiction, etc, which is then followed by a burlesque performance inspired by the piece. Hosted by the ravishing Rarity St. James. Get your tickets here – they’re almost gone!! And dress up “wicked” and receive five free raffle tickets! SEE YOU THERE!! I apologize for being a major slacker in the posting department! 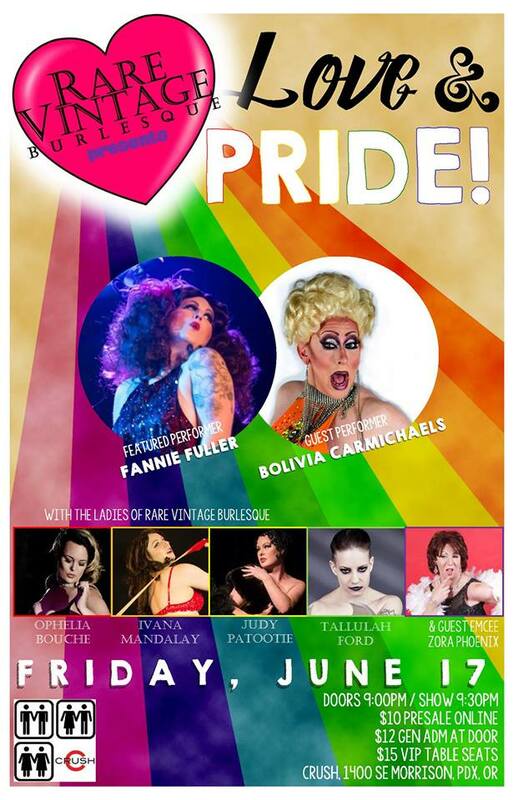 I was unable to participate in Rare Vintage Burlesque‘s June show, Love and PRIDE!, due to having to go out of town. Wouldn’t you know it – it was our first sold-out show! And by all accounts, what a show it was. We turned it into a benefit for the families of the victims of the Pulse nightclub shooting in Orlando, and it was a grand success. I apologize again for not posting about this until now. Thank you so much to everyone who attended and all the beautiful performers who made this an unforgettable experience!